Over 60 participants from Croatia and Serbia came together on September 29th to take up on a new EU-funded project. Focusing on the need to preserve and better manage cultural heritage in Slavonija, Baranja and Vojvodina, the S.O.S. project starting conference builds upon the shared history of two sister cities – Osijek and Subotica. 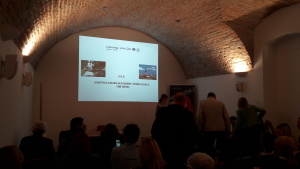 Revitalization of architectural heritage in Subotica and Osijek. Developing a joint secession heritage database, containing information on secession buildings, sites, cultural institutions and organizations in the project area. Creating a secession thematic route, consisting of tourist posts, touchscreen displays and a bronze model of the city of Osijek for visually impaired people. Providing history and culture management-specific educational sessions. Organizing a road show exhibition with photo contests, storytelling programs and similar activities. Reflecting the region’s rich cultural history, the starting conference was hosted in the Archeological Museum Osijek and attended by all the project partners: Tourist Board of the City of Osijek (CRO), Tourist Organization of Subotica (SER), City of Osijek (CRO), City of Subotica (SER) and Regional Development Agency of Slavonia and Baranja (CRO). Co-financed by the Interreg IPA Cross-border Cooperation Programme Croatia-Serbia 2014-2020, the S.O.S. project seeks to achieve new tourism qualities and by doing so it will strengthen economic and territorial development of the cross-border area. For more information on projects funded within the Interreg IPA Cross-border Cooperation Programme Croatia-Serbia, follow us on our Programme Website news feed and Facebook page. By HDIT|2017-10-02T14:39:42+00:00October 2nd, 2017|Comments Off on S.O.S. project kicks off!